Melissa Saggerer (Simmons GSLIS ‘10) and Amalia Child (Simmons GSLIS ‘11) entered our 3000th book into the Storefront Library catalog just before closing this evening. Over 5000 books have been donated since the project began. Read all about the collection here. 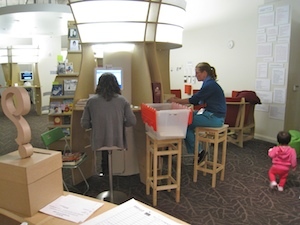 Thanks to Valerie Wong, Susan Chin, and Astrid Müller for working this afternoon on today’s cataloging drive. The more books we bring online, including Chinese language materials not readily available, the more we can learn about how to design a collection for a permanent branch library in this neighborhood. The library will be closed for Thanksgiving and will re-open on Nov. 28. See you after the break.